Gritty: Nice guy or nightmare? There's a sound of polite surprise people often make when they learn I'm a hockey fan. Perhaps it's because they know me as an arts advocate or aspiring writer, or because my hobbit-like physique doesn't exactly scream former athlete. But as it turns out, having wildly disparate interests is part of being human! You know, containing multitudes? I've loved hockey since I was tiny. I grew up in a house where my dad loved the sport and played it recreationally, so we had a backyard rink of sorts with a full-sized net where my sister and I shot pucks at my dad under the pretense of helping him practice. As an adult, my basement walls are covered in hockey memorabilia, including a poster commemorating the Seattle Metropolitans, the first U.S. team to win the Stanley Cup in 1917. The recent announcement of a Seattle-based NHL team (to begin play in 2021) means my home state team will compete again for a chance to hoist the cup. Put simply: You can't truly experience hockey until you see it in person. Television can't do it justice. The strength, conditioning, skill and mental toughness the sport requires is stunning, and even the fundamental ability to balance on a thin metal blade while alternating between sprints and sudden stops on a sheet of ice is impressive. Seriously, have you gone skating lately? Try that but also put on 10-20 pounds of equipment, carry a stick and have the hand-eye coordination to pass and shoot a small rubber disk while skating, knowing that while you have the puck, another player could legally check you at full speed. Oh, and be ready to skate backwards on defense and throw your body in front of a 110-mph slapshot. For context, imagine voluntarily placing yourself in front of a Serena Williams' serve but at much closer range and with the object hurtling at you FROZEN SOLID. One local point of entry is the Spokane Chiefs. The games are loose, fun, family-friendly and affordable, plus you get to see some incredible players before they make it big. Many former Chiefs currently play in the NHL, including Derek Ryan (Calgary Flames), Tyler Johnson (Tampa Bay Lightning), Jared Spurgeon (Minnesota Wild), Kailer Yamamoto (Edmonton Oilers) and others. Sit next to me and I'll explain the rules, but if you make any cracks about halftime, I'm prepared to take a two-minute penalty for cross-checking you into the boards. The only choice is Gritty, the Philadelphia Flyers' new mascot. Gritty is everything. Gritty is the blank canvas upon which all humans project our sincerest hopes and deepest fears. 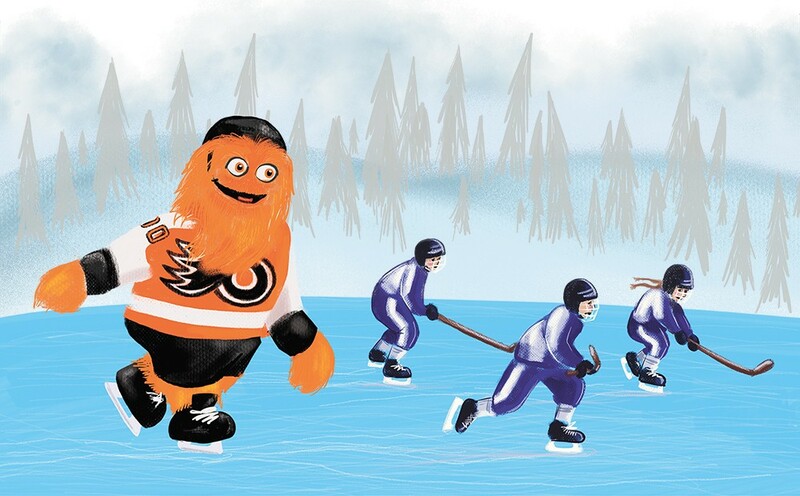 Even Philly fans love Gritty, a plot twist I never would've expected from the people who once booed Santa Claus then pelted him with snowballs (true story). Let's hope old St. Nick is ready to let bygones be bygones, because I'm hoping to find Gritty's googly eyes peering out of my stocking on Christmas morning. This is a place I refer to as heaven on earth. The warm, friendly staff with a sense of humor, the regulars who know everyone's names and team affiliations, and did I mention there's popcorn? For a truly next-level experience, stop by on Jan. 1 to watch the Winter Classic, the NHL's annual outdoor game played every New Year's Day. This year's tilt features the Boston Bruins versus the Chicago Blackhawks, played at Notre Dame's football stadium at 10 am on NBC. There's no better way to kick off a new year. If you're not quite ready to jump the boards and blast a slapshot yourself, ease into learning the sport through film. The Mighty Ducks and Slapshot are two favorites, along with Miracle on Ice, the story of the ragtag 1980 U.S. men's hockey team who defeated a seemingly unbeatable Soviet Union team and went on to win Olympic gold. Miracle On Ice is a solid sports movie, but if you're interested in the collision of history, politics and sport, don't miss Of Miracles and Men, an ESPN 30 for 30 documentary which examines the same events from the perspective of the Soviets. If you like those, keep the streak going with Red Army, another documentary on Soviet hockey, produced by Werner Herzog. Earlier this year, 38 years to the day after the U.S. men defeated the Soviet Union team, the U.S. women's team defeated Canada to win the gold medal at the PyeongChang Olympics. The game was one of the most thrilling, beautiful games of hockey I've ever seen, and if you missed it, go watch the entire thing right now. Seriously. It had everything: a classic rivalry, the backstory of how the U.S. women spent the prior year fighting for pay equity, plus overtime, a shootout, a game-winning goal scored using a triple deke (the move made famous by The Mighty Ducks) and finally a clutch save by the U.S. goalie to secure the win. I get chills thinking about it. Hockey contains everything you may already love about sports — the unpredictability and excitement, stories of human triumph over adversity, a community of fellow fans — but adds the greatest trophy in the world, announcers sporting mullets in the year 2018 and the Canadian national anthem. Honestly, need I go on? If you're interested in playing but don't know where to start, Spokane has recreational leagues for all ages and a wide range of abilities. You can choose your own level of competition and most are non-checking leagues, like Spokane Women's Hockey, which fields four rec teams who play Friday nights as well as in tournaments. If you have interested kids between the ages of 5-18, look up the Spokane Americans Youth Hockey Association, better known as the Spokane Jr. Chiefs. They can suggest where to get skating lessons, help you understand what equipment is needed, where to snag gear that other kids have outgrown and more. The original print version of this article was headlined "Embrace The Ice"